Small (24 Months - 2T) - $40.99 Only 2 left! Especially if you live in the northern hemisphere, you know what cold is like. When the season starts to change, you have the frequent fear that snow is not only around the corner but is bringing with it all of its best friends: ice, freezing temperatures, sleet, and ferocious polar bears. Yes, we know, it seems shocking that you can run into a bunch of giant furry monsters just because it is cold, but we know for absolute certain that this is definitely how it works. Science! Now, there are a few things that you can do to protect yourself form the dangerous polar bear menace. It begins with not being cold. If you can warm yourself up, then technically it is like it isn’t even cold, and that can sometimes trick the polar bears into heading back home. They think, “Hmm, that person isn’t chilly, so I guess it isn’t cold here?” Obviously polar bears aren’t cold to begin with—thanks to all that fluffy adorable fur—so they are entirely dependant on looking at us to determine what temperature it is. (That’s how being warm blooded works, of course.) Science! But, there is an even better solution. Polar bears cannot resist anything equally adorable. It puts them into a total passive and cuddly mode, effectively reducing their threat level to nothing. 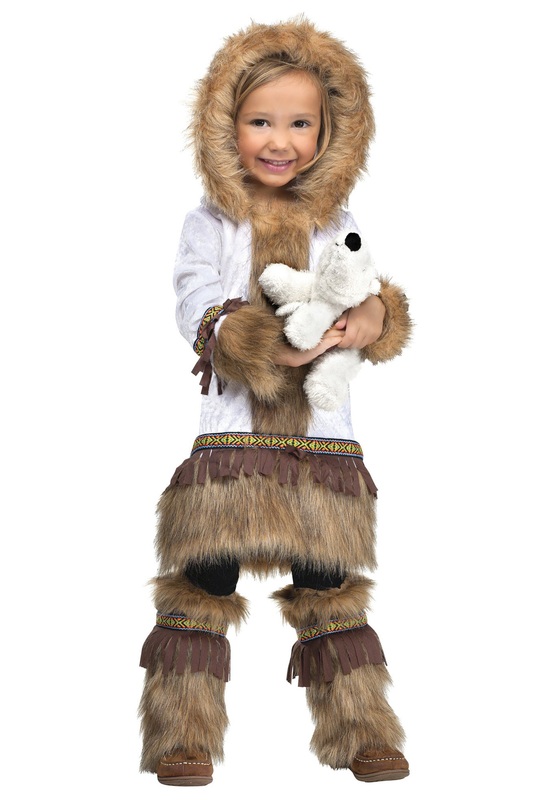 So, we have blended all of these protection measures together into one amazing polar-bear-proof regalia in this Toddler Girls Inuit costume. This soft white jacket has brown faux fur trim and colorful tassels along the sleeves. The matching fur shoe covers give a pretty authentic look while the hood pulls up to embrace your kiddo’s head in a halo of adorable fur. Your tyke is going to look as cuddly as possible, ensuring protection from alarming cold. Include a cuddly stuffed polar bear to show that your tyke is the master of the frozen north. Disclaimer: Immunity to real life polar bears is only speculated and screaming “Science” does not actually count as sourcing your claims.